Also known as Eostre. The Equinoxes are the balancing points in the cycle of the seasons, when the day and night are of equal length, reminding us of the harmony of the whole. 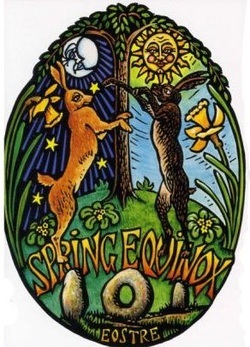 Buds of flowers and leaf, all manner of eggs and just-born life are celebrated in decorations and imagery as Pagans rejoice in the Earth's reawakening. The urge of spring is to do, create and bring in the new. Here light overcomes darkness with lengthening days bringing the magic of new growth. Ostara is associated with childhood and new life, and the God and Goddess are perceived as children, personifying youth and innocence before their entry into adulthood. The Goddess, as the Maiden, covers the earth with flowers and love while the God grows to maturity. This is a time to honour the masculine and to celebrate everything that is great about being alive.